What paint color is frequently left out of consideration as a design solution? For many people black would not cross their mind as a wall color. The common wisdom is that small spaces need to be painted light colors so they don't feel claustrophobic. But frankly a small white, pastel, or beige room can get boring. Black is associated with mystery, the unknown, power and even death. So maybe we just need a little black inspiration. These well lit spaces take on a sophisticated air with black walls. 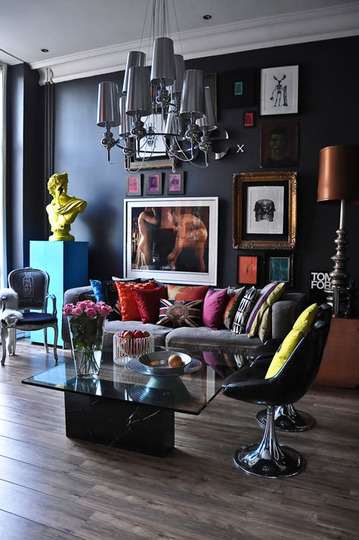 For those people who like a room full of colorful objects and furniture, black walls can be a centering base. Black works visually to accentuate each color it touches. The black also does great things for art, which glows on black walls. 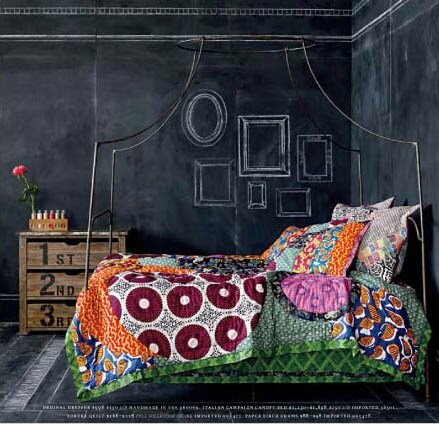 Black chalkboard paint is also a fantastic option for the adventurous painter. With these walls you could change the decor with the bit of drawing. So will you consider black for your home? Black, as a background color, brings focus to all the colors it plays against.